Understanding Itchy Eyes: What Does It Mean When Your Eyes Are Itchy? Home » General Health » Understanding Itchy Eyes: What Does It Mean When Your Eyes Are Itchy? There are things that happen within our bodies that are kind of commonplace. Things that you don’t really think about, but depending on the cause, they might have some significance. Take itchy eyes for example. We’ve all had them at one point or another, but what does it actually mean if you have itchy eyes or ocular pruritus? In this article, we’ll take a look at everything you need to know about itchy eyes. We will discuss itchy eyes diagnosis, itchy eyes treatment, and home remedies for itchy eyes. Itchy eyes are one of those things that we’ve all had at one point or another. But have you ever wondered what actually causes itchy eyes? The answer is, quite frankly, a lot of things. Your eyes are organs that are pretty much exposed to the outside world. And while the eyes do have some defense mechanisms in place to try and protect themselves from various irritants, they are still easily affected. Here are some things that can cause itchy eyes. One of the symptoms of allergies tends to be itchy eyes. This is especially true of seasonal allergies like ragweed, as the eyes are one of the first systems that will encounter the allergen. Debris of various sorts can get into your eyes and can cause them to itch. A loose eyelash, dirt, and other things getting into your eye can cause them to water and itch, in an attempt to get the debris out of the eye. Smoke, whether it be from a camp fire or from tobacco, can irritate the eyes to the point where they become itchy. Things like hairsprays, air fresheners, perfumes, and other airborne chemical irritants can make your eyes itchy. Environmental factors like wind, smog, and sunburn can make your eyes itchy. Viruses and infections may be the underlining issues causing your eyes to be itchy. Things like conjunctivitis, blepharitis, dry eye syndrome, Sjögren’s syndrome, and photophobia are some of the more common medical causes to itchy eyes. With that many causes, some of which are rather serious, your best bet is to go see a doctor and get a proper diagnosis if you have itchy eyes. So, you have itchy eyes and they aren’t going away. You go to the doctor to make sure that you get a proper diagnosis. The doctor will start with a little bit of your medical history (knowing if you have any allergies, for example, can rule out certain things). The doctor will then examine your eye for signs of infection, allergy, etc. It should be noted, if you see any of these symptoms, you should see a doctor as soon as possible. Now that your eye has been properly diagnosed, the doctor will probably recommend a course of medical treatments. Depending on the cause of your itchy eyes, there may be a few medical treatments that will work to clear it up. For itchy eyes caused by dryness, there are artificial tears eye drops that can help moisten the eyes. This will slowly get rid of the itch. Many eye infections are treated with eye drops that will help clean out the infection. Another treatment for viral and bacterial eye issues is antibiotics. These are usually used in combination with an eye drop of some sort. An anti-inflammatory may also be prescribed and used to reduce the itch and inflammation of the eye. There are also a number of home remedies that help ease your itchy eye problems. There are a number of homes remedies for itchy eyes that can be easily made and used. The one thing to note, if you have something like conjunctivitis (pink eye), don’t use something on the infected eye, and then move it to the uninfected eye as that can cause the infection to spread to both eyes. A cold compress made of something as simple as a damp cold cloth can help relieve the symptoms of itchy eyes. It can also help relieve some swelling which can also help calm itchy eyes. Green tea can be used to help calm itchy eyes. Make a cup of green tea and allow it to cool. Use the green tea as an eye flush. This works best if used twice a day until the itch disappears. Using cucumber is an effective itchy eyes home remedy. This green vegetable has long been used to help get rid of swelling, puffiness, and eye irritation. Use sliced cucumber that has been chilled in the fridge for at least 15 minutes. Place the slices on your eyes for at least 15 to 20 minutes, five times a day for best results. Much like cucumbers, chilled, raw potato slices can relieve itchy eyes. Place a chilled potato slice over each eye for 15 minutes just before bed. Repeat this for at least three days for best results. Rose water can help get rid of itchy eyes by using it as a rinse. Use this remedy twice a day, for a few days. As odd as it may sound, cold milk may help your itchy eyes as well. Take a cotton ball and dip it into cold milk. Rub the cotton ball along the affected eye, or use it as a cold compress. This works best if used twice a day, once in the morning and once in the evening. These home remedies may help relieve your itchy eyes. However, if you think your itchy eye issue is due to an infection or virus, see a doctor as soon as possible as these methods will not be enough to treat it. 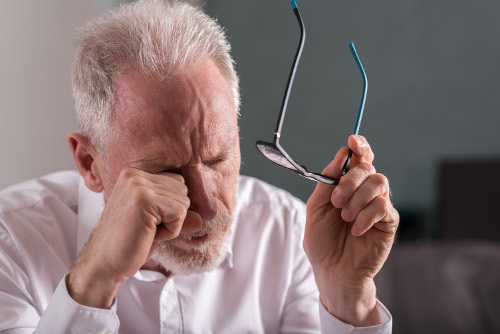 Eye infections can easily result in horrible consequences for your eyes, and the last thing you want to do is lose your sight due to not getting treatment fast enough. Of course, the best method of getting rid of itchy eyes is never getting them in the first place. If your itchy eyes are caused by allergies, try your best to avoid the thing you are allergic to. Wear eye protection such as safety goggles to protect you from chemicals at work, or sunglasses to protect your eyes from the sun. Both might be able to protect you from what is causing your eye to itch. Finally, get your eyes checked regularly. The doctor or optometrist might be able to detect a cause of itchy eyes before it really takes hold, saving you some time and effort. As we’ve explained, if you have itchy eyes, it’s not really an issue. They can be easily dealt with medical and home remedies, but the most important thing is that they are dealt with. Your itchy eyes may just be the result of allergies, but in the chance that it’s not, you want to make sure your eye gets cleaned up quickly. Hellem, A., “Itchy Eyes: Causes And Cures,” All About Vision, December 2016; http://www.allaboutvision.com/conditions/itchy-eyes.htm. Bashour, M., “Itchy Eyes: Causes, Symptoms, and Relief,” Eye Health Web, September 2015; http://www.eyehealthweb.com/itchy-eyes/. Falcon, D., “Burning And Itching Eye Symptoms,” Symptomfind, May 7, 2016; https://www.symptomfind.com/symptoms/burning-eyes/. “Home Remedies for Itchy Eyes,” Top 10 Home Remedies; http://www.top10homeremedies.com/home-remedies/home-remedies-for-itching-eyes.html.